On the day of June 29th I was at my friends lake with a couple of close buddies. The sun was shining and the water was calm so we decided to go out on the lake and have some fun. We were tubing and waterskiing until a terrible storm came out of nowhere. We hurried to dock up the boat and get to shore quickly. My friend and I decided to start bringing in the tubes so that they wouldn't fly away. During this action a tree collapsed on to me and my friend. Luckily he only acquired a fracture in his foot, but on the other hand, I suffered from several injuries. Most of my ribs were fractured, I had 2 pelvic fractures, 2 collapsed lungs and worst of all my T-8 and T-9 vertebrae were fractured. Because of the damage to my back, it left me with an incomplete spinal cord injury, not allowing to move or feel from about my belly button down. Due to wrestling and lifting 6 out of 7 days week, I survived this accident. My neurosurgeon told me that an average boy my age would've died from the impact. That is what I am thankful for. When I woke up from unconsciousness the first question I asked was "How is everyone else?" As they told me that everyone was fine besides my friends foot fracture, I was extremely relieved. Later on in my journey through the hospital I told my mom "I'm going to get through this, I always find a way." After two months in the Rehabilitation Institute of Chicago, my lungs, ribs, and pelvis healed only leaving me with my damaged spinal cord. Five days a week I go to therapy fighting my hardest to just walk again. I also have continued my sophomore year in high school. On June 29, 2012, four days before Independence Day, Andrew Podczerwinski was enjoying his summer break with his friends in Bass Lake, Indiana. The day was beautiful and filled with smiles. The morning lake aroma blended in perfectly with the beautiful summer weather. Everyone was enjoying water sports and the atmosphere of the natural lake. While tubing and waterskiing on the lake; without warning, a storm came out of nowhere with heavy wind, that tore through the Bass Lake area. The wind was so strong, that boats started flipping over and some flung up on shore. Andrew Podczerwinski was bringing in tubes to his friend’s lake house, and was running up a yard attempting to get cover from the severe storm. 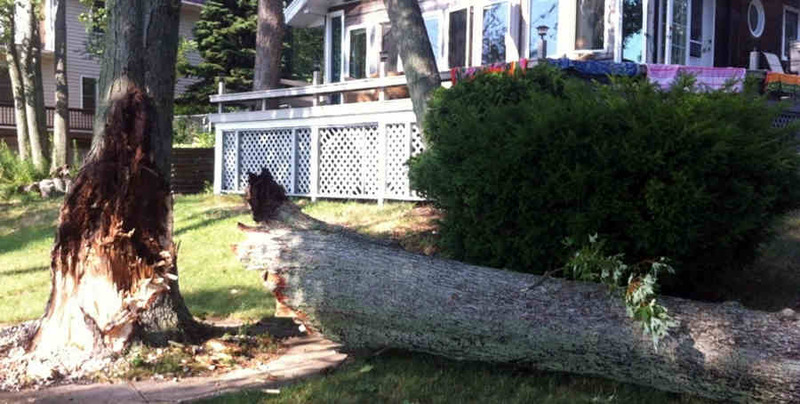 While running, he was struck by a falling tree knocking him to the ground. Because of a small landscaping rock sticking out above ground, he was not crushed. Andrew’s friends rushed to his aid, someone called 911. However, because of the severe storm, the road was rendered, practically unnavigable as trees blocked portions of the road. There was a prolonged response by local EMS due to inability to navigate the roads. Finally, when paramedics arrived, Andrew was found lying in the lawn on his back with his legs on the tree. He was transported to IU Health Starke Hospital for treatment. Andrew was unable to move his lower part of body and he had no sensation in his legs. At Starke Hospital his temperature dropped below the required temperature for normal body functions, and he could not breathe. He was incubated with oxygen. Also drainage chest tubes were placed due to the collapsed and bleeding lungs. Andrew’s blood pressure dropped to a level that after each heartbeat, the brain, and other parts of his body were in danger, because he was not getting enough blood. Immediately, Andrew received a blood transfusion. Due to the seriousness of his injuries, there was not much more that could be done at this small hospital. Memorial MedFlight was consulted to transport Andrew from Starke Hospital to Memorial Hospital for a definitive trauma treatment evaluation. Upon arrival at Memorial Hospital, several hours after accident, Andrew’s condition was progressively worsening; he was again suffering from oxygen shortage and low blood pressure. ER doctors were afraid that unless this is reversed by effective treatment, he can die. Diagnostic radiology was performed ASAP, which indicated that his chest tubes placed at Strake Hospital are not working properly. Andrew’s lungs got separated from the chest wall. New tubes were placed without delay in the emergency department. Additionally X-Rays revealed damaged spinal cord, broken ribs, shoulder, fractured pelvic bone, and hip. Andrew’s MRI scans convinced doctors that his spinal cord was severed due to the extreme displacement of his vertebrae. “This,” they said, “means he will never walk again.” The doctors’ words gave us no hope. The MRI told us that his T8 and T9 vertebrae had a complex fracture with dislocation. Andrew had to undergo 5 hours of back surgery the next morning (Saturday, June 30). Surgeons realigned his spine by drilling 10 bolts, and attaching two steel rods, between T6-T11 and fusing a piece of bone to his vertebrae. In addition, Andrew was taken to the Vascular and Interventional Radiology Department, where an inferior vena cava filter (IVC filter) was implanted by vascular surgeons to prevent life-threatening blockage of the main artery of the lung. After all the surgeries, doctors told us that Andrew’s Spinal cord injury (SCI) is classified as complete, which is associated with permanent paralysis. We were told that Andrew’s complete SCI will result in total loss of motor and sensory function at and below the level of injury. Subsequently, Andrew was placed in the intensive care unit (ICU) where he was connected to a mechanical ventilation apparatus. A few hours after surgery, his lung tissue collapsed again. Moreover, he developed malignant hyperthermia, which is a rare life-threatening condition that was triggered by exposure to drugs used for general anesthesia. His body temperature rose to above 105 degrees. His heart rate and breathing rate dangerously increased to a level where if not treated quickly it would cause certain disability or death. ICU staff heroically fought to bring him back. Furthermore, he had a bronchoscopy and a large blood clot was removed from his airway passage in the respiratory tract that conducts air into the lungs. It is hard to describe what we, parents, went through during Andrew’s stay in the ICU. His lungs kept collapsing, he had hemothorax without (blood in pleural cavity), and several bronchoscopy procedures. During the 4th of July weekend, a life-threatening complication in form of a big blood clot in a deep vein was discovered. However, Andrew with his athlete's mentality, has fought with this all this time and he is planning to continue fighting. Andrew started rehabilitation therapy at the Rehabilitation Institute of Chicago (RIC) on July 13th 2012. Initially, he was unable to even sit longer than few minutes. Since then, he has made significant improvements. His diagnosis changed from complete SCI to incomplete. Presently, Andrew is continuing rehabilitation program at RIC twice a week, and three times a week he participates in an aggressive, long-term rehab program at NextSteps Chicago, which is part of the Reeve Foundation NeuroRecovery Network (NRN). These past few months have been very difficult for our family. We are emotionally exhausted since Andrew’s accident in June 2012. It hurts so much to see Andrew confined to a wheelchair. This freak accident on an ordinary day just shattered our lives and restructured our priorities. We thank God that he spared Andrew’s life. We believe Andrew will walk again. When this happens we will take Andrew to Bass Lake, and find the exact spot in the field where he went down. He will lie there for a second, and then he'll get up on his own power and walk away to start a new life.